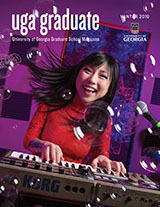 Thank you for your interest in graduate education at the University of Georgia. To learn more about our graduate programs, application deadlines, funding opportunities, and upcoming recruitment events both on and off campus, please complete our Inquiry Form. For a list of our graduate programs, click here. To learn more about our Business programs, click here. To learn more about our Legal Studies programs, click here. To learn more about our MBA program and the application process, please click here. To learn more about applying to the College of Public Health and the application process, please click here. To learn more about applying to the UGA Law School, please click here.